Buy NutraGold dog food online at Pet Circle and enjoy the convenience of delivery straight to your door, always at the best price – or we'll beat it. Whether your dog is a show dog or a rescue mutt from the pound, NutraGold believes that they deserve superior nutrition. Made in the United States, NutraGold pet foods are formulated in order to enhance the performance, appearance and overall everyday health of your pet, each and every day. 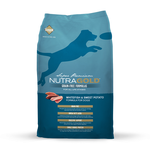 NutraGold dog food is 100% grain free and contains only high quality, easily digestible meat proteins as well as fruits and vegetables that provide a great spectrum of nutrients as well as an ideal lean form. Meanwhile, a blend of omega 6 and 3 fatty acids promote healthy skin and coat in your dog, making it an excellent choice for dogs that suffer from irritable skin. NutraGold's all life stages diets also contain a number of fermented lactobacillus strains to promote good gut health and digestion. Furthermore, for dogs that require a single-source protein food, NutraGold offers a whitefish and sweet potato recipe to keep their bellies calm and happy.